Here is my first software development update of TOFFEE-Butterscotch. In my first TOFFEE-Butterscotch news update I have introduced about TOFFEE-Butterscotch research, project specifications, use-cases, etc. So just before making the same ready for the Raspberry Pi port and a release, I thought its a good idea to support Alerts (notifications) as well. 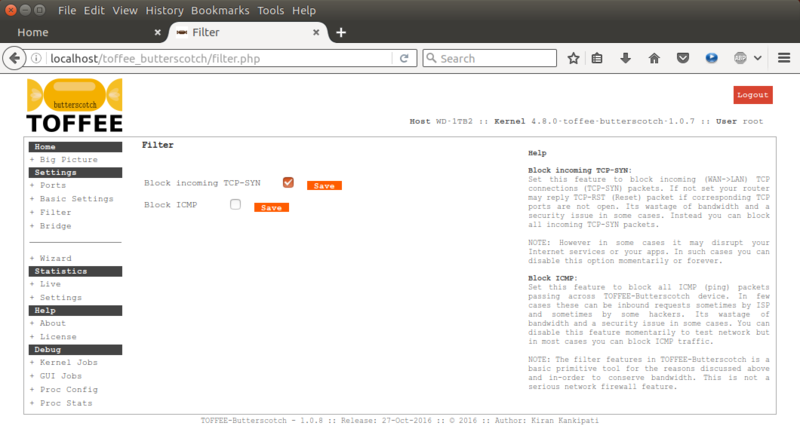 These alerts gives us an idea what is happening in the network when filters are set. As one can understand some of these filters are optional and sometimes it may disrupt network services and may introduce connectivity issues and may be app issues too. Home page alerts are a good way to monitor this activity. And if required you can disable the same. On the other hand these alerts also may help you to track any suspicious activity happening in your network inbound or outbound. 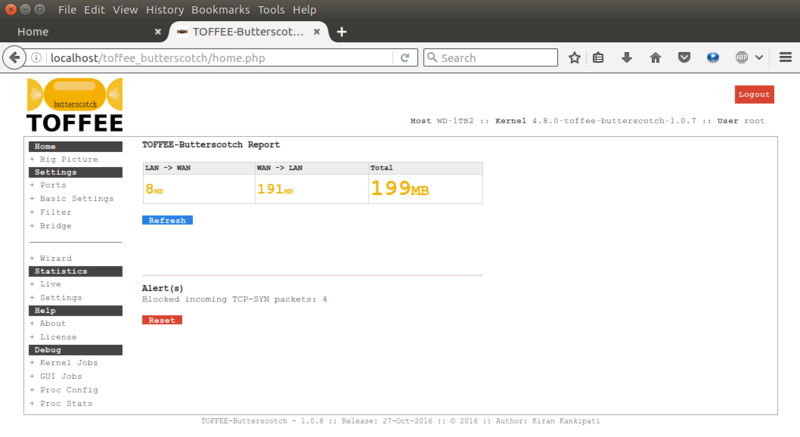 Introducing TOFFEE-Butterscotch Alerts: These are simple packet counters which corresponds to the filter type. For example if the incoming TCP-SYN packets are blocked then its corresponding alert counter will increment whenever such a packet arrives and gets filtered (dropped). These counters (alerts) will work and shown in home page only if such filter filter is set. If no filters are set then it will completely disappear in the home page. Case1: Here is a case in which both Block incoming TCP-SYN and Block ICMP filters are set. If you notice the Blocked incoming TCP-SYN packets alert, it tells us there there is an attempt from some remote host. And if there is a rapid constant increase in this number then it may be due to a deliberate DoS attack or some kind of malicious network activity. Where as in the case of Blocked ICMP packets alert, it denotes there is inbound or outbound ping activity which is blocked. If it is not an outbound ping from your LAN, then it could be an external source trying to ping your connected router's IP. Once you are ok with the alert counters at any time you can reset these alerts and start catching them fresh. Sometimes you can imagine these alerts as notifications. Case2: Here is a case in which both Block ICMP filters is disabled. This will reset its corresponding alert and make it disappear in the home page. If you have any feature requests expected to be supported on TOFFEE-Butterscotch software you can kindly send me your ideas and suggestions.